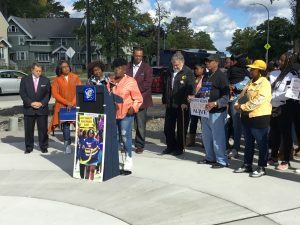 Saturday, Mayor Lovely A. Warren, councilmember Adam McFadden, Assemblyman Joseph Morelle, SEIU 1199 workers, family and members of the community gathered to dedicate a new pocket park at the intersection of Dewey Avenue and Driving Park Avenue to Latasha Grayson-Shaw. Shaw was murdered in broad daylight at this very location. It was Eleven years ago, on September of 2007, when Shaw was killed by a mob of mostly young women and teenage girls with baseball bats, sticks and knives, while trying to defend attacks on her daughter. Results of this senseless act of violence left children without a mother; other family members, colleagues and a community with a hole in their hearts for their loved one. A stand for justice and healing after the murder was taken by McFadden, who led a six week street level campaign to find the attackers and murderers of Shaw. The murder of Shaw drew shock and outrage as police struggled to identify the perpetrators despite a crowd of witnesses. One man was convicted, while one woman was acquitted of murder and other charges. 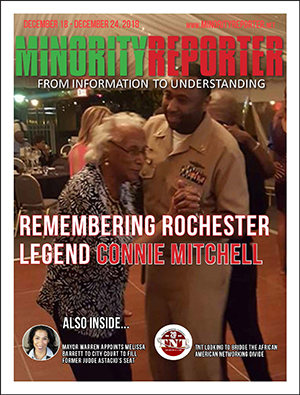 Since the slaying of Shaw, McFadden has been at the forefront to address this matter and keep her memory alive. He also thanked Zola Brown a family member who has been the life force for the initiative to memorialize Shaw. Robert L. Grayson, father of Shaw held the golden scissors, while other family members, city officials, SEIU 1199 members and community supporters participated in the ribbon cutting ceremony. To honor Shaw’s memory a plaque detailing the dedication will be mounted on one of the pillars of the pocket park. Also, a black iron bench with another plaque “The City of Rochester dedicates this plaza to the family of Latasha Grayson-Shaw as a place of gather and remembering” is permanently positioned. Warren shared an analogy presented by Judge Caroline Morrison, a resident of the area. Judge Morrison presented a thought that before you pull that trigger go sit in the bathroom for twenty-four hours and think about it. See if you can do that for twenty-five years to life. “What I promise you is that we are not going to stop the fight against violence. We are holding people accountable for what they do in our community and on our streets. If you make a decision that you are going to pull the trigger and end a life, we are going to make sure that you do twenty-five years to life in prison.” Warren promised. “This day for me has been so heart filling that I love it. I will never be able to ask for more from the city than to have this park dedicated to my sister. Whoever passes this park will be reminded of the incident. Hopefully others will be reminded to think before they act,” stated Shaw’s sister, Charnette Grayson.